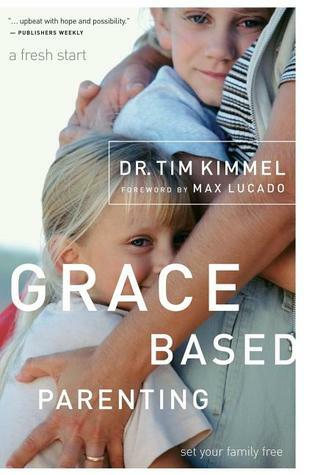 I just finished reading Grace Based Parenting by Dr. Tim Kimmel. This was the first parenting book I have ever read (except if you count Ferber's sleep training book). The catch phrase inside the cover says, "Raise your kids the way God raises his". Before I even started reading, I knew I liked the idea of this book! We don't like to spank or be too harsh with discipline, but have worried about how to balance that out and create a solid foundation for our kids. This book was the perfect fit for us! He actually doesn't take much of a stance about discipline techniques (to spank or not to spank), but focuses on every interaction we have with our child. I really liked this book because it reinforced what my instincts have been telling me. I also really liked this book because it fit well with what we have been discerning about risk in our lives, about stepping out in faith. Kimmel teaches you how to raise kids who are secure in their faith and unafraid to step out in that faith. I also felt like the parenting he was describing was the parenting that I saw in Bob Goff's Love Does book. He warns against legalistic methods of parenting and also means of parenting that aim to keep your kids safe/sheltered. He talks about how children (and really everyone) have three driving inner needs: a need for security, a need for significance, and a need for strength. We can meet those needs for our kids by giving them the gifts of love, purpose, and hope. He goes through each of these (a chapter on each) and does a good job of both explaining through description and through examples, both of how to do it right and wrong. After describing these needs, he goes on to talk about how we should give children the freedom to be different, the freedom to be vulnerable, the freedom to be candid, and the freedom to make mistakes. Again, he explains in a chapter on each how these will look in our lives. While most of this book resonated with what I already think and feel, it did challenge me in certain areas. One thing Kimmel points out is that we often tell our children 'no', not because they are actually doing anything wrong, but because others around us might think we are a "bad parent". I know I have been guilty of this with my overly rambunctious kids! "If anything, grace should motivate you to a higher holiness. Grace-based homes aren't places where family members assume they can say whatever they want, see whatever they want, hear whatever they want, taste or drink whatever they want, or touch whatever they want. That's not grace. That's someone wanting to live his or her own life with no regard for what God has said or what He thinks. But when grace is in place, there is clearly a different attitude toward sin than in homes without grace. If I could summarize grace in one sentence it would be something like this: "As love as you are pleasing God, you're pretty much free to do whatever you want." But keep in mind that "pleasing" God is contingent on our faith in Him, not on our ability to maintain a righteous and moral standard as so many assume. Hebrews 11:6 says that "without faith it is impossible to please God." People who walk by faith are far more capable of developing a godly and righteous lifestyle because they are finding their power for living in their personal relationship with the Lord." I think this book is a worthy read for everyone with kids, especially those who want to figure out how best to infuse their kids with a love of Christ. I found you off Housewifespice. I'm heard about this book before and have always been intirgued by it. I love the idea of grace based parenting and what the book describes sounds like the philosophy I naturally lean towards. I think I'm going to go see if I can find this book in the library. My library had it, so hopefully yours will to! I really hope you read it!!! I always look forward to your book reviews - thanks for sharing! I've heard of this book before, and your review makes it sound really helpful!